Do you know a student who would embrace the chance to participate in the Global Awareness Summer Programme? – Will investigate and propose an innovative solution for Canterbury tourism. 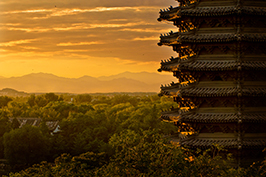 The programme will see successful applicants travel to Peking University in China, where they will gain an insight into Chinese society, language and culture. Peking is not only an elite Chinese university; it has a reputation that extends across the globe. It was recently named the 21st most prestigious global university according to the 2016 Times Higher Education World Reputation Rankings. 2016 is the first time this prestigious opportunity has been offered and it’s made even better by the fact that students will be enrolled in PACE295. When they complete the requirements of this course, they will earn 15 points credit. There will be an information session about this programme at 5pm on Wednesday, 20 July 2016, A9. Previous PostEPECentre GREEN Grid team scoops awards at EEA conferenceNext PostKeen to showcase your freshwater-related research?